If you are like me, apps are becoming an essential part of your workflow – from mapping out sketches, to gathering ideas, to taking notes and filing invoices. But there are just so many options out there. How do you filter through them all to find applications that work for what you do? I have a handful of “old faithful” apps that I use on my phone, iPad and online as well as a few app only tools that are rather new. By using a mix of software applications, I have been able to work more efficiently and hopefully save time. 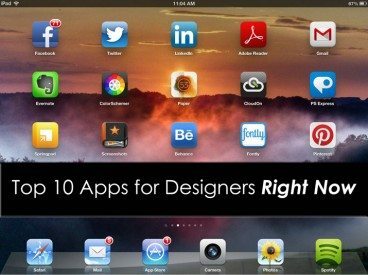 Here are 10 great apps for designers – some may be familiar but hopefully you’ll find something new that you love. Evernote is one of the all-time best apps out there for keeping organized. It works across devices – smartphone, tablet and desktop over the cloud, so once you save something you can retrieve it anywhere. And with extra add-ons like Web Clipper and Skitch you can “save” webpages to a personal file and then mark them up for reference. It is a great way to bookmark and create reading lists that you can go back to at any time. Evernote also offers a paid, premium account that offers added functionality such as shared notes and files. Evernote is available for desktops (Windows or Apple), iPad/iPhone, Android and Blackberry. We can all agree that very little intense editing is being done on tablets and phones right now. But for simple touchups and edits, Adobe Photoshop Express is a great tool. For those already using Adobe products, there is a very small learning curve and it looks and works as you would expect. Simple tools are included with the download and a few more advance features are offered in-app. There are fun tools for added effects, giving you more control than Instagram and sharing is made easy too. Adobe Photoshop Express is available for iPad/iPhone and Android. Ever met a potential client on the street and did not have a business card or work samples? The Behance app allows you to have your portfolio at your fingertips. Show off your portfolio in seconds and use the app to browse for ideas. It has all of the functionality of the full website in a portable format. My one wish? That the app included a contact feature similar to Bump, for sharing that information with other smartphone users. Behance is available for iPhone/iPad. Anyone who’s ever had to open and edit a Microsoft Office document – Word, PowerPoint or Excel – on a tablet knows it is no fun. But CloudOn makes them compatible with your device. It also syncs with Dropbox or Google Drive so that you can edit, save and keep moving along without having to copy, paste and email information for document updates. The best part of it all is that everything looks and works just like the original file. Cloud On is available for iPad/iPhone and Android. One of the best writing tools out there, iA Writer allows users to sync through the cloud or Dropbox so that documents are always available. The clean interface works like a charm and does not need fancy bells and whistles. It just works. The keyboard extension is a nice touch – no flip to access punctuation – and the app uses Apple’s built-in dictionary. Plus you can easily print, email and export. iA Writer is available for iPad/iPhone. Ever see something in real-life color and want to use it for a design project? That’s where Color Schemer comes in. The app is a fun little tool that lets you create color palettes or browse some of the ones created by other users. The app helps you create great RGB or HEX color pairings using photos, or with the built-in color wheel. Plus, if you are a COLORlovers website user, you can sync your palettes with your account. ColorSchemer is available for iPhone/iPad. Instagram meets typography in this fun app where you can share photos of type in the real world with other users. The app is fun to use – what type geeks don’t love to show off their finds – and is great for seeing how others are using typography in interesting ways. This app is a great source of inspiration. You do have to create an account and register to use the app, which also has a neat online component that allows you to find type photos by location. Fontly is available for iPad/iPhone and Android. New freelancers can benefit from having a little help when it comes to pricing and this app does just that. My Price helps you determine what to charge for projects and includes great tips three times a week. Registration is required to get started and you need to enter some basic information to help calculate an accurate price. Plus you can save past information to help estimate future project pricing. My Price is available for iPhone/iPad. There are so many great websites that I happen on when browsing. Screenshot Journal allows you to grab those screenshots and collect them in a more organized and useful way, so that they don’t get lost in the hundreds of other photos on your devices. Plus Screenshot Journal has a neat grid overlay feature that helps you determine how big something is on the screen. Screenshot Journal is available for iPhone/iPad. If you like to sketch (and share) Paper is one of the top tools out there. (It works by touch, but is even better with a stylus.) The app has a variety of tools — sketching, outlining, writing, coloring and even color mixing – available for in app-purchase as well. The outline tool is nice – it resembles a nice marker. The added bonus here is that everything you draw in paper is shareable via social media or email. Paper is available for iPad. Not only can apps help you organize, brainstorm and work more efficiently, they can also be a lot of fun. Just looking at a variety of interfaces and usability options can be inspiring in itself. What do you think? Are there other apps you would add to this list? Share them with us.